Gilmore Girls: No Hope for Season Eight? Gilmore Girls fans have been on a rollercoaster ride this season. At the end of last season, the show lost its creator Amy Sherman-Palladino and her husband, co-executive producer Daniel Palladino. Fan reaction to producer David Rosenthal’s storylines have been mixed at best. To be fair, Rosenthal took on a very difficult job and was left with a lot of storyline challenges. Whether you liked it or not, most would agree a so-so season is better than none at all. Things can always get better, right? How about if this was Gilmore’s last year? Gilmore Girls debuted on October 5, 2000 on the old WB network and made the jump in 2006 to the CW. 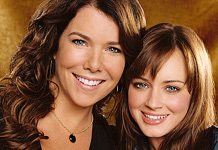 The series focuses on the relationship between young single mother Lorelai Gilmore (Lauren Graham) and her daughter “Rory” (Alexis Bledel). Set in the small and quirky Connecticut town of Stars Hollow, the relationship drama is well-known for its trademark wit, quick repartee, and a plenty of pop-culture references. It’s generally believed that CW would like to bring it back next year. It’s easily one of their most popular shows and the network schedule isn’t exactly overflowing with strong prospects for the 2007-08 season. The possibility of an eighth season of Gilmore Girls however has been looking tenuous at best for awhile. The two Gilmore leads have, at different times, publicly expressed either dissatisfaction or a desire to move on. At the beginning of this year, Graham was given a producer credit on the show. Considering the timing, it seems likely this was done to ensure her interest in continuing for another season. Actually, word is that most of the cast (Melissa McCarthy is doing an ABC sitcom) has been signed for another year, with the exception of Bledel. After spending seven years on the series (over 25% of her life), it’s easy to understand why she might want to do other things. Still, it was generally believed that something could be worked out — perhaps even limited Rory appearances. It now appears that those expectations have changed. The word from TV Guide’s Michael Ausiello is that negotiations have stalled (presumably with Bledel) and aren’t likely to get better. With just a few episodes left to shoot this season, a final decision will have to be made soon if there’s to be any kind of fulfilling closure to the series’ seven year run. Actually, part of that closure could already be in the works. As regular Gilmore fans know, Rory has long had a fascination with CNN correspondent Christiane Amanpour. After six years fruitless attempts to have her on the show, Amanpour is now scheduled to make a cameo in the May 8th episode. Will this be the series finale? Stay tuned! Gilmore Girls: Officially Cancelled, No Season Eight! Gilmore Girls: An Abbreviated Season Eight?